Not long ago, I watched as a friend navigated the murky waters of the foundering ship that was the food company where she worked. Even when you see on the inside the cogs beginning to give way, it can be so hard to abandon ship. You want to believe that the brand you’ve known and love will muster through and make it to the other side of whatever battle in which they are entrenched. It can be incredibly jarring to invite a product into your refrigerator (and really, into your life) only to be made aware of its disappearance on the shelf and the subsequent absence it creates. 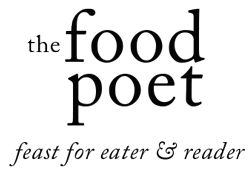 How do you fill that need for a particular taste and the void it creates in your lexicon of ingredients? Out of sentimental attachment last fall, I discovered in a hotel room in Austin that my preference for vanilla had changed. I had changed. It felt like a sort of betrayal to shift my vanilla ice cream loyalty elsewhere. Was I any less of a Texan? Working at a food company makes you privy to so much that goes on behind the scenes and all the people essential to making a product succeed, including, of course, the customers themselves. You want to cheer on companies whose foods align with your values, whose flavors make you rally support in dollars spent. I have no idea the statistic of food companies that fail. It’s a question far too depressing to consider, really. Instead, I focus energy on applauding the effort—the belief that something tasted good enough that it must be shared. That all the countless hours spent getting a product on the shelf (not to mention the tireless efforts to keep said product on the shelf) are worthwhile. Perhaps it comes as no surprise that I’ve circled back to Fudge Popsicles and reconsidered my position. Because I’m older, I can be specific as to why Fudge Pops never quite did it for me as a kid (icy, water-based or skim milk-based which might as well be water). I owe that discovery also to mouthfeel and that I relish chewy popsicles. Because I’m older, I’ve made batch after batch of ice cream and the small failures along the way have led to the big reveal: life is short. Anything worth doing should be worth it even if it doesn’t last forever. We all have expiration dates on us, even businesses and brands. 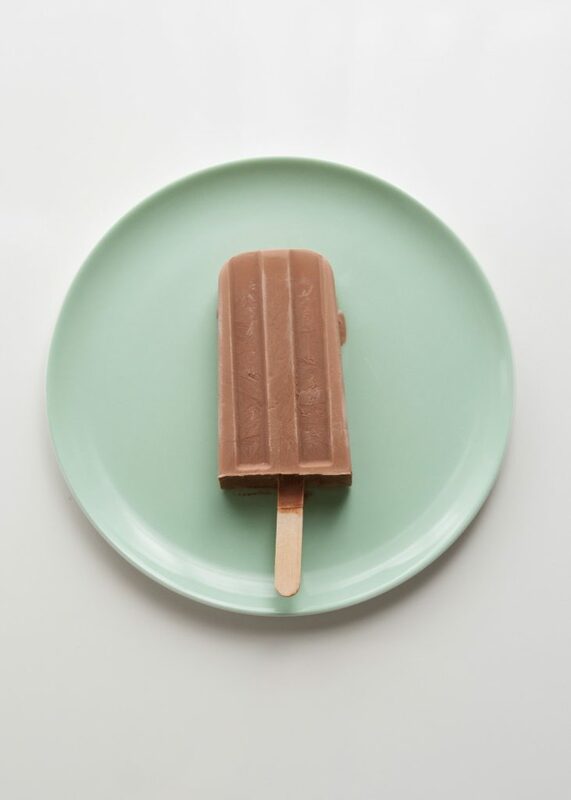 While we are able, life is meant to be lived, and sometimes that requires Pink Peppercorn Fudge Popsicles. These popsicles are inspired by a perfect square of Fauchon Pink Peppercorn Chocolate that brought me bliss from a recent souvenir care package. 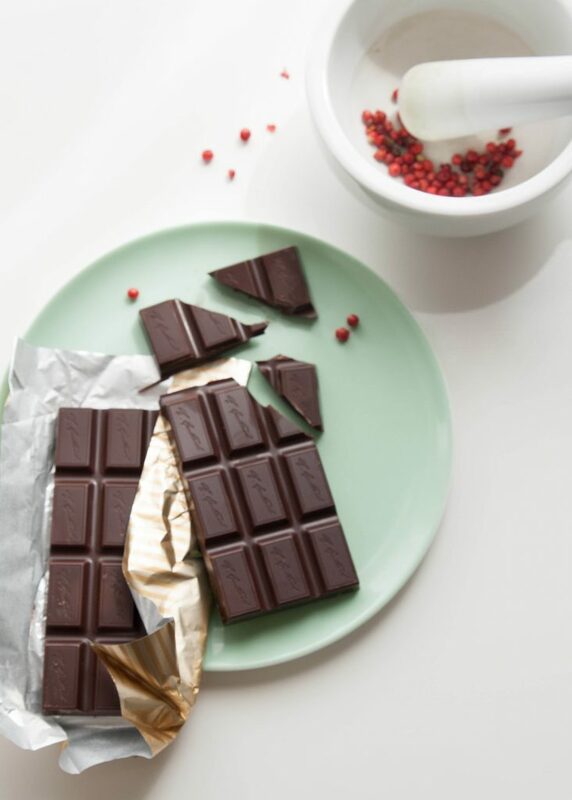 In my desire to recreate that sensation of dark chocolate melding with citrusy pink peppercorns, I decided these flavors would make a fudge pop for all other fudge pops to reckon with. I swear by Guittard 70% bittersweet chocolate, after recipe testing five different kinds of chocolate for the truffles recipe in Steeped. It’s my preferred chocolate and that coral red box claims to hold 6 ounces but my scale pronounces it 6 ¼. 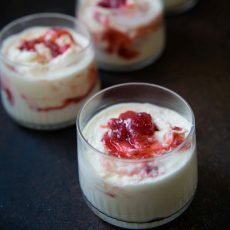 When developing this recipe, I tried to hold back on the sugar because I didn’t want the popsicles too sweet. 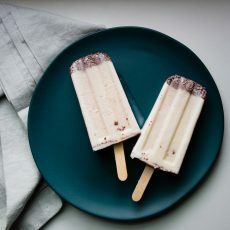 I finally arrived at the amount below once I relaxed and remembered that sugar and salt amplify flavor—so you will find the popsicles are not cloyingly sweet, instead the chocolate and peppercorn flavors play up satisfyingly. I dedicate these popsicles to good friends who have a wicked sense of styling and find food photography a fun afternoon endeavor (Here’s looking at you, Steph) and friends who love you enough to tote special French chocolates back from the city of lights (bisous, mille fois, Olga). 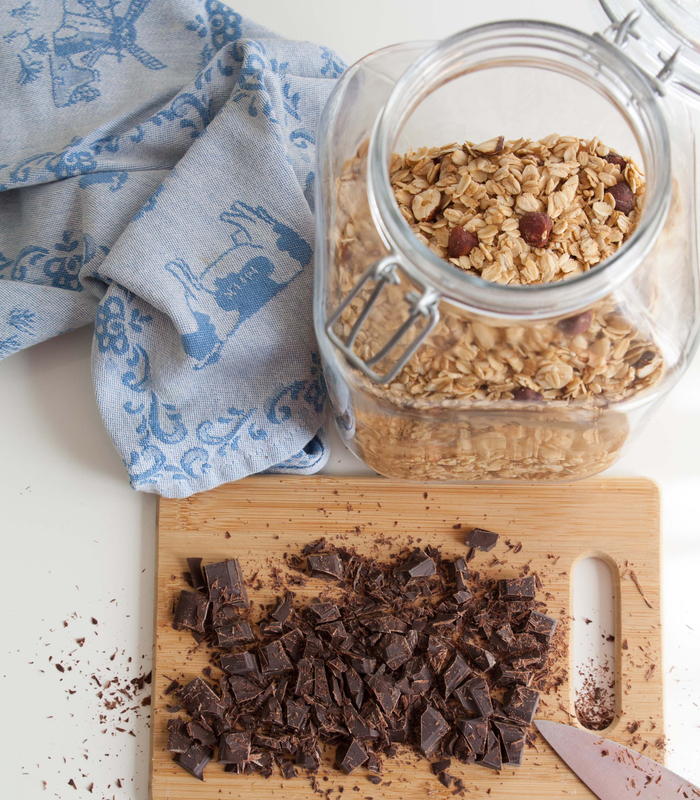 Place the chopped chocolate into a medium stainless steel bowl with a wooden spoon nearby. 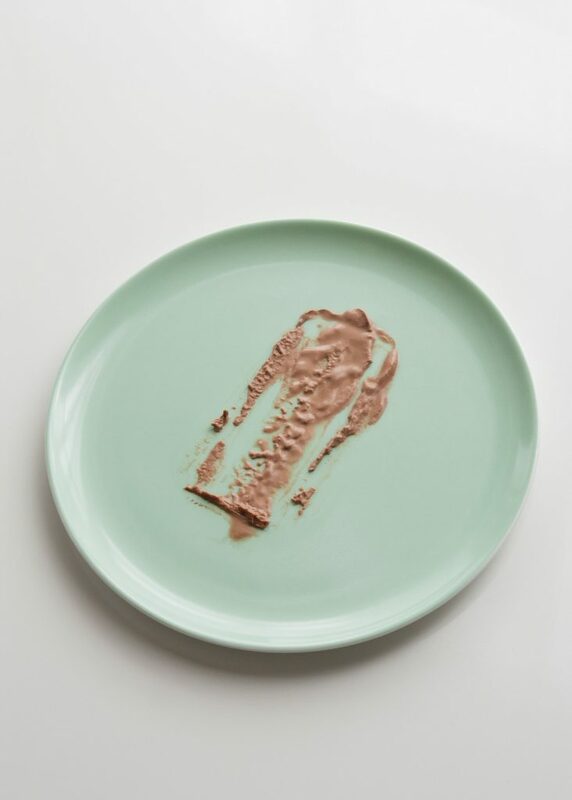 Bring the cream and water to just under a boil, whisking in the cocoa powder, salt, and sugar once tiny bubbles prick the outer edge of the saucepan, until dissolved. Remove from the heat once the bubbles grow to the size of a pinhead, usually 30 seconds to 1 minute longer. Meanwhile, grind the peppercorns to a medium-coarse consistency in a mortar and pestle. 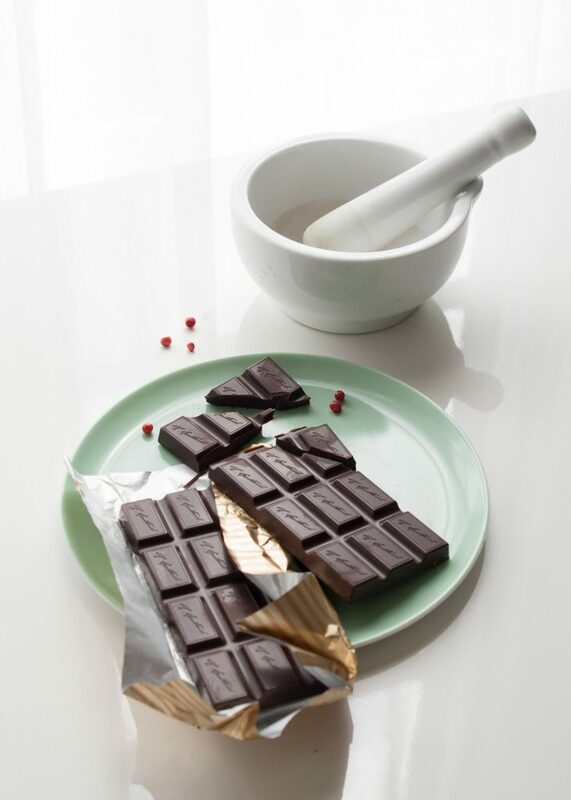 Pour 1/2 cup of the hot cream into the chocolate while stirring until the chocolate has melted. Continue stirring, pouring in the remainder of the hot cream. Stir in the peppercorns. 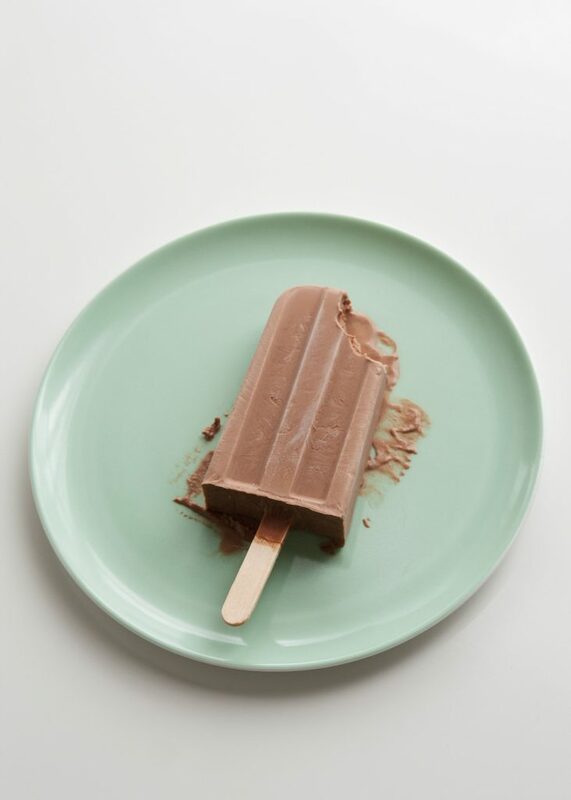 Pour the hot fudge cream into the open wells of a popsicle holder. Insert the popsicle sticks and freeze for 3 to 4 hours.